As a woman over 40, I fully expected to be dealing with skin aging issues - dullness, wrinkles, hyperpigmentation. I didn't expect to still be dealing with pimples and blemishes. I felt like an alien - an old broad with teenage zits. My first reaction was to deal with the pimples the same way I did when I was a kid - drying tonics. Sure, some of them work as spot treatments, but drying out all of my skin is bad. Now I know that my oily skin still needs moisture, and that the balance of oil - along with knocking out the pimple-causing bacteria - is the way to keep my skin looking better over the long term. Avanti RX's Clearly Luminous Serum introduced me to two ingredients I've never seen in skincare before - Lilac Stem Cells and Spin Trap. I did a little looky-loo on the Interwebs to find some info on these, but they are pretty cutting edge, and there's not a lot out there that I could find. There is some evidence that Lilac Stem Cells possess multi-faceted benefits in skincare, being more effective at fighting inflammation than hydrocortizone and interrupting the process that leads to hyper-pigmentation. Spin Trap is a new kind of weapon in the free-radical war. Most anti-oxidants attack indiscriminately and chemically turn free-radicals into water. Spin Traps are 'intelligent' anti-oxidants and stabilize the molecules before they become free-radicals - thereby avoiding any damage. 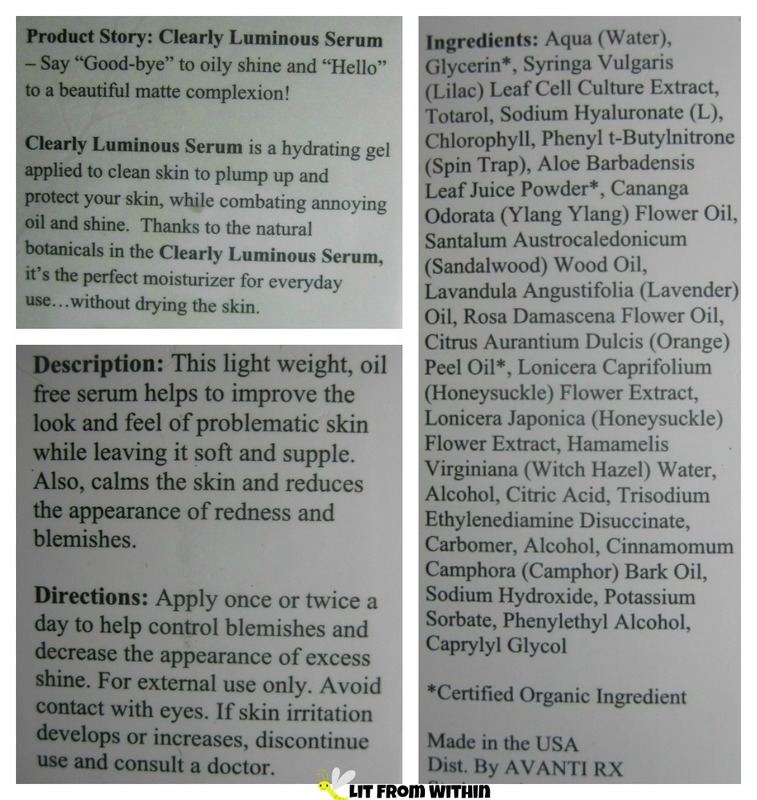 The Avanti product line was developed by Dr. DePasquale to provide botanically-based treatments for skin conditions, and that philosophy is very evident in the ingredient list. This serum is paraben- and gluten- free, and made with lots of natural and organic ingredients, such as Aloe, Witch Hazel, Sandalwood oil, Lavender oil, and Orange Peel oil. It has a very subtle, light scent that I can't quite identify... maybe honeysuckle? I like that it doesn't smell like medicine, as so many blemish treatments do. I love the pump dispenser for keeping my serum safe from light and contamination, and it dispenses the right amount of the light greenish serum for me to use on my face. Green? 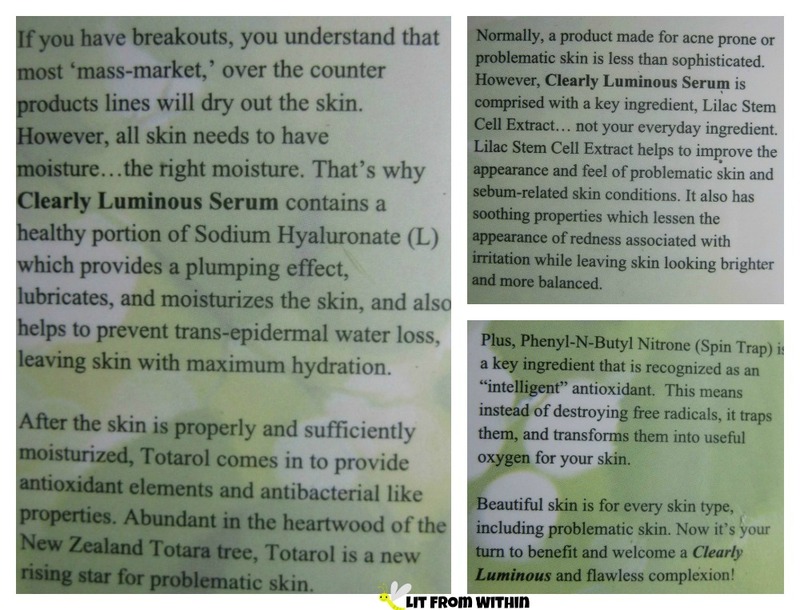 Yep, it's a clear, green-tinged serum. And if you know your color wheel, you know that green cancels out red, which is the color many people deal with on their face if they have irritation or outbreaks. It's not going to make all the redness from an acne breakout disappear, but for someone like me that has minor outbreaks, or has some redness from broken and healing pimples, the green can help cancel out the redness and make my concealers more efficient. Even though the serum is tinted, it doesn't leave a layer of color on the skin - only a radiant glow that isn't greasy or glittery. 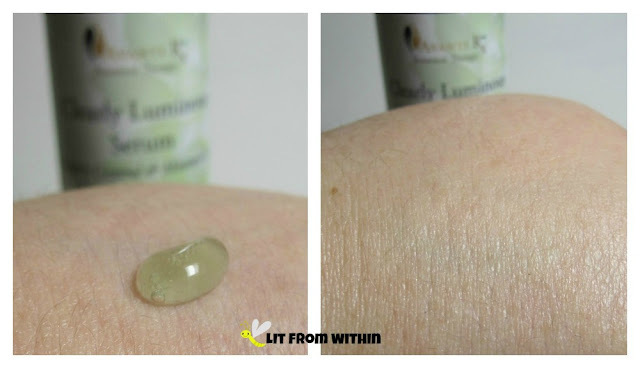 I love that my skin looks brighter and more youthful, but without the pimples! This really is a great serum for my skin type and particular issues. Now my moisturized skin looks smooth and healthy, and my oil production is more balanced. Avanti Rx-inspired nailart! I used Color Club French Tip for the base color, and painted leaves with Deborah Lippmann Mermaid's Dream. I painted the logo with Maybelline Bold Gold and Wet 'n Wild Black Creme. 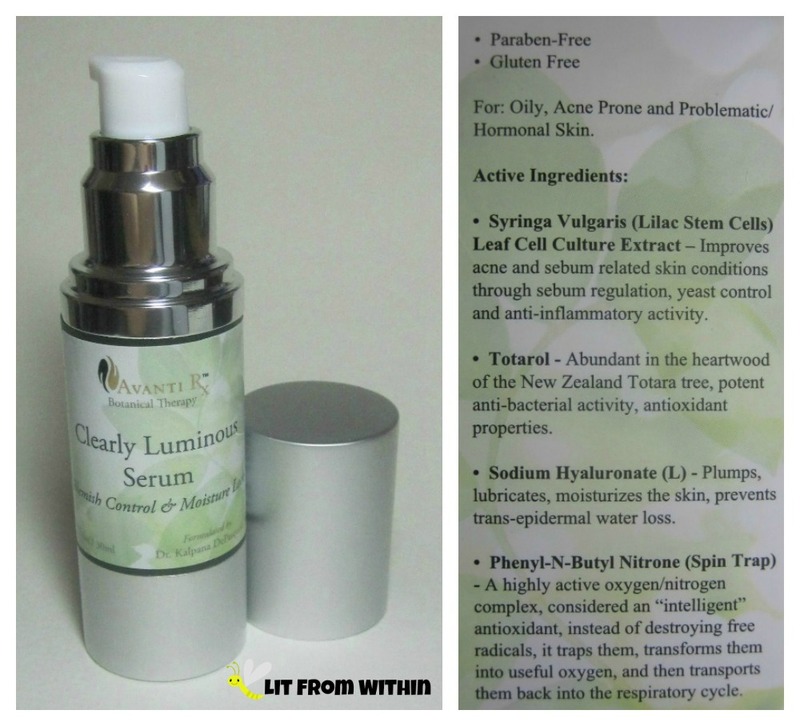 If you have oily and aging skin, with hyperpigmentation or dullness, this serum could work for you, too. For more information, or to purchase, you can find Avanti Rx on Facebook, Twitter, Google+, YouTube, Instagram, and on their website, where this serum currently retails for $42.